← No substitute for intelligence? Modern armies have 30 or so support staff for every fighter at the tip of the spear. The ratio of support to active fighters in the war to secure individual liberty is even more skewed. For every Alan Gura, thousands of people spread the ethical and technical components of the culture which includes weapons as a facet of the most valuable diamond — self-determination. Ironically, the people who value individual freedom most are communistic in the original meaning of that word. They cooperate closely with each other to keep the goals in sight, inching towards those goals against the encroachments by would-be post-feudal lords. In a sufficiently advanced feudal society, the masses including you and me are but sheep for the shearing and eventual slaughter. Keeping our hooves and horns, along with the mindset governing their effective use, is a matter of survival for us as individuals and for us as a liberty-oriented culture. This entry was posted in civil rights, interesting people, pistol, rifle, rkba, self-defense, sound suppressor, training, weapon and tagged 22LR, gemtech, girl, ruger. Bookmark the permalink. 6 Responses to Have you shared your knowledge lately? Your assertion (or is it implication?) that gun owners are working “against the encroachments by would-be post-feudal lords” is laughable in both its naïveté and disingenuousness. The average gun owner is no more committed to freedom and liberty than, say, the average ACLU member. Let Appleseed start the process for you. 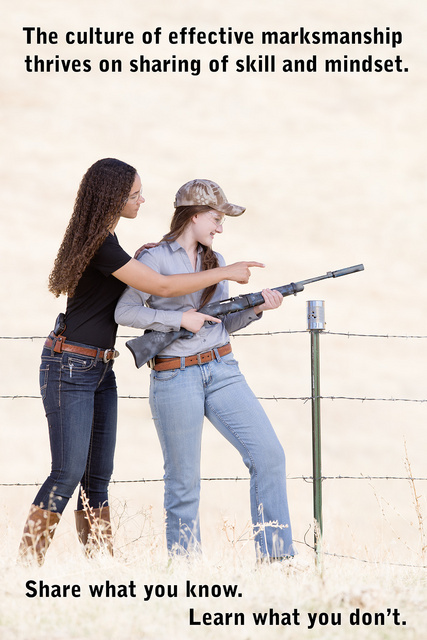 Probably the most important shooting you will ever do is when you are introducing newbies to firearms, firearms safety, marksmanship, and the “I refuse to be a helpless victim” mindset. Those of us over the age of 50 have a duty and responsibility to pass the torch of liberty to the next generations. Criminalizing the touching of another person’s gun without a state-authorized transfer is the #1 way the Bloomberg ghouls can destroy the right to keep and bear arms in America. They are already pushing this in Nevada, and are preparing to do the same in Maine. They’ll push this poison state by state as far as they can. Once it becomes too “difficult” to own a gun, or learn anything about them except at a state-sanctioned facility, most people won’t bother, and of course the ignorant will vote against the rights of those of us who do. The Bloomghouls are counting on this to break the gun culture.